The aim of this study was to classify the polymeric prosthetics used for hernia repair based on biomaterial composition and weight in an effort to clarify to surgeons what kinds of material they are dealing with and to provide a standardized system of categorization. An intensive research effort was carried out on prosthetics that are commercially available worldwide. We conducted a search of the medical literature and companies’ websites to find the weights and thicknesses of commercially available prosthetics. Where these data were lacking, we contacted manufacturers directly in order to render the research more complete. A total of 166 products were considered for classification based on biomaterial properties. Among these, a homogeneous group of 80 polypropylene monofilament knitted or woven prosthetics was selected for classification based on weight. Weights were provided for 70 prosthetics (87%), and both the weight and thickness was provided for 40 prosthetics (50%). Classification based on weight: Ultra-light <35 g/m2, Light ≥35 < 70 g/m2, Standard ≥70 < 140 g/m2, Heavy ≥140 g/m2. Classification based on biomaterial composition: simple (prosthetics made of one pure biomaterial); composite (prosthetics made of two or more different layers); combined (prosthetics made of two materials knitted or woven together); and biologic. Weight and biomaterial classifications were proposed after an extensive analysis of commercially available prosthetics. The need for a common terminology is important to avoid misunderstandings among clinicians and technicians. 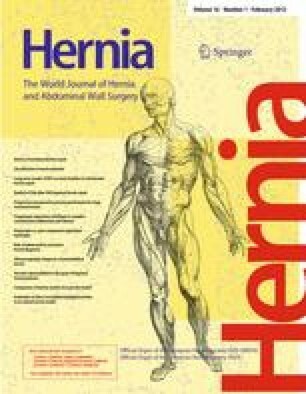 This paper concerning the classification of prosthetics used in hernia repair has been developed with the co-operation with Herniamesh Srl, [Via Fratelli Meliga 1/C, Chivasso (TO), Italy]. The authors apologize in advance for any imprecision, oversight or omission about products and companies and kindly request that companies contact them with any suggestions or comments that will further improve upon the database. A.C. declares that he received no grant support for this work.